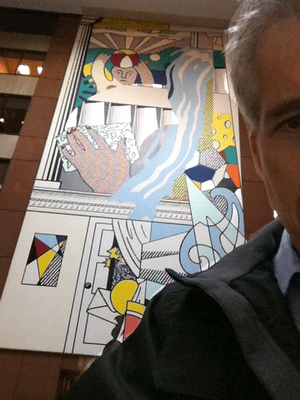 Mural with blue brush stroke (1987) is a five-story high mural in the atrium of the Equitable Life Assurance building on 7th Avenue and 53rd Street by benday dot master Roy Lichtenstein. I had always tried to get a photo of it but pictures are not permitted. The cracker jack lobby security guards are quick to jump on anyone who pulls a camera out of their bag. I just got a 3G iPhone and the Facetime feature includes a forward facing camera. So by pretending to send a text message, I was able to take a pic over my shoulder. The work is a nice piece but this photo looks kind of washed out. The colors are more vivid in person. I haven’t mastered my iPhone’s camera functionality yet. Now that I have an iPhone I feel like I’ve been given a seat at the cool kid’s table in the cafeteria. The Facetime feature is kind of useless to me since I don’t know anyone else with a 3G iPhone. I resisted the iPhone for years but now that I have one I kind of see what the fuss is all about. I was out for lunch eating my ham sandwich and saw this homeless woman acting in a most peculiar way. This pic doesn’t do it justice. 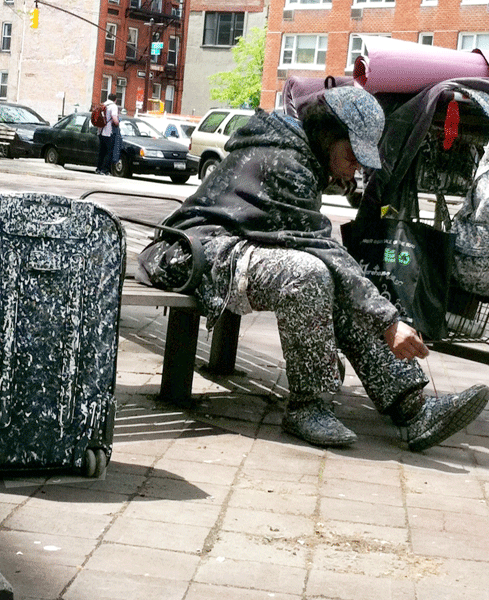 It makes it look like the suitcase is covered with pigeon droppings. But the work is actually quite detailed and delicate. 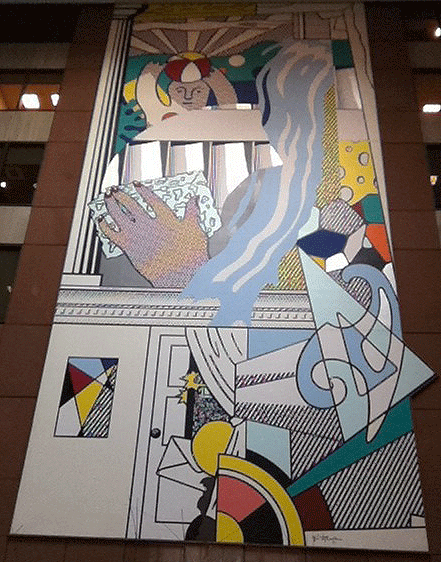 I would hazard to say that the effort and number of hours spent on her project might rival that of Mr. Lichtenstein’s mural above. It made me wonder how the arbitrators of art—the ones who hold the purse strings and dole out commissions—get their position. And what separates one artist, who has his work displayed in corporate atriums and is a multimillionaire, from another artist who has the same burning need for artistic expression but is homeless. To me, these things have more to do with chance and circumstance than the quality of the work itself. I’ve seen works on display at MoMA that didn’t have the same depth of thought as that suitcase. Brilliant post. I like the way you connected the dots! Looks like she has a yoga mat on top of her cart too. There is a movie about a homeless man in NYC who was a painter and actually got discovered I seem to recall and received some recognition. I may be confusing two movies but I believe he was Asian and many of his paintings/drawings reflected his past experience of being interred in one of our ghettos for the Japanese back in the war. Someone, a woman, let him live in her teeny apartment for awhile, later found him a subsidized home and at the end of the movie he returned to the interment camp for a visit. They are now tourist spots (sort of). suki: Why thank you! I probably shouldn’t look to validate my life via my blog posts but, unfortunately, I do. So I appreciate the compliment more than is healthy. For the record, there are lots and lots and LOTS of street artists in Manhattan.Sav: I don’t know what her vision is but I can tell you she’s got more creativity in her left hand than I do in my entire being. Good work Agent 86!I enjoy “found art” very much. You’re right, chance and circumstance play a much larger part than actual talent but i could write a dissertation on this particular subject so i’ll shut up now. Lot’s of artists working out there in all kinds of circumstances. The art world is something else. I know so many good artists who never get the recognition they deserve and others who are hugely successful and all I can do is shake my head in wonder when I look at their work. Go figure. XL: I’ve seen lots of found art that deserves to stay lost. Just saying. Kono: I think luck has a much larger role in success than people are willing to admit to themselves. Everyone thinks they make it on pure sweat but I don’t think that’s the case. Sharon: You’ve had a front row seat for years. You are an expert on the subject. SF: Thanks. The quality of the pics will improve when I master the phone. Until then, just mind the content. Aren’t you the sneaky fella! ;-)I’m toying with the iPhone idea. Won’t until Dec. when I can do a free upgrade, but it’s definitely on the list. There are lots of people on my contact list who have iPhones already (esp. family) for the Facetalk thing would work for me.Too bad the Homeless Lady hasn’t jazzed things up with a tiny bit of colour. I think it would look very cool if there were little accents of colour in her white dotty world. Then again, perhaps she only thinks in black and white and that’s why she’s homeless? read this: http://www.history.org/foundation/journal/spring04/throne.cfm This is written by the Williamsburg museum that had it for awhile, but it’s back in DC.my favorite piece in the entire smithsoniam museum system is this. made by a man who was a janitor, from ‘found’ objects (light bulbs, cardboard, scraps of metal, and tinfoil).he just did it. not for money. not for others. because he had to. Ponita: I resisted the iPhone because I was so sick of hearing about it but I have surrendered. I still hate the battery, though. I can’t carry a spare!Dinah: I seriously always mean to stop. It’s so much to maintain. But something always comes up that I need to write about. I’m caught in a trap of my own design!Daisy: Thank god you’re just typing and not driving. I remember having a discussion about this guy when you were in NYC. He came to mind when I wrote this post. Well done on your photos.Your homeless lady could well have taken her place with the contestants in ‘Show me the Monet’ where all kinds of people brought all kinds of paintings, photos, sculptures etc, to have three hanging judges decide if they were original, showed good technique and had an emotional impact sufficient for them to be hung in the Royal College of Art Gallery – gateway to recogniton, fame and fortune.BTW I have almost finished ‘The Man in the Wooden Hat’ which saddens me. Every bit as good as FILTH and I don’t want to let go.Read it and tell me what you think. In the UK at the moment they’ve made millions of pounds worth of cuts in the arts budget. Our local Literature Festival has had its entire funding cut, for example.As much as I’m opposed to this, and did as much as one individual can to oppose them, there’s sometimes far much more feeling and vibrancy in non-subsidized art. The gallery of the moment where I live is run by a group of unemployed or under-employed people who simply had nowhere to show their work because they haven’t got the right names on their CVs. I’m with you on this one, luck is probably the most important aspect of it, ask one Vinny Van G. who never saw a dime while alive, and i’m with the janitor who builds thrones, you do it to do it, if someone pays you fine, in my case i’m gonna do it anyway so what’s the difference, and like Nursie i’m big on the outsider art. I wonder why they don’t allow photographs to be taken of the painting, perhaps they believe you’ll steal its soul? I read something yesterday about how Apple products affect the same part of the brain as religion, so watch out. nurse: Great interview. thanks for the link. There’s a big outsider art fair in Manhattan every year. Attention is being paid.Pat: Sounds a bit like Pop Idol or The X Factor for artists. I approve. thanks for the book recommendation. I’m trying to read GOD IS NOT GREAT by Christopher Hitchins but it’s kind of boring. I may bail out, which is something I rarely do.looby: I just read that Andrew Lloyd Webber is selling on of his priceless paintings — Picasso, I believe — and donating all the proceeds to arts foundations. If that’s true, good on him.kono: I don’t think anyone paints with the expectation that it will result in wealth and fame. That’s just not rational.Eryl: I read that article on Apple, too, and I TOTALLY believe it! People who are steeped in Apple products seem to walk around in a narcotic stupor. Actually, that suitcase looks better than about 70% of the work at the National Gallery in Melbourne. Where’s Andy Warhol when you really need him? Basquait anyone?